Notes: This station name appeared only in Bradshaw of August 1844, the first month that the Ferryhill – Brockley Whins line was included in the timetable. The southern terminus at Rainton Meadows is assumed to have closed when the line southwards to Ferryhill and Durham opened, and Rainton is shown clearly as a through station by Bradshaw. If Rainton station actually existed it would most likely have opened to passengers with the through line on 19 June 1844. Quick (2009) suggests that the station might have been placed in the timetable on the assumption that Rainton Meadows would be replaced with a station on the through line. Tickets from Michael Stewart except 400 JC Dean. Bradshaws from Chris Totty & Nick Catford, Route maps drawn by Alan Young. 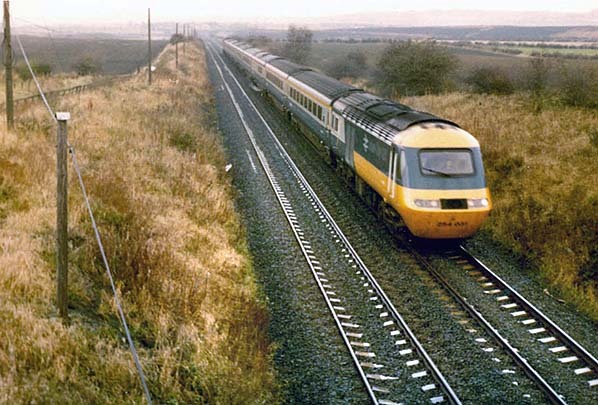 In November 1980 a diverted southbound East Coast main line HST approaches Marks Lane bridge, a possible site of Rainton station (if such a station existed). 1895 1:2,500 OS map. It is uncertain if this station existed; it might have been no more than a misprint in Bradshaw of August 1844 – the only reference found to such a station. 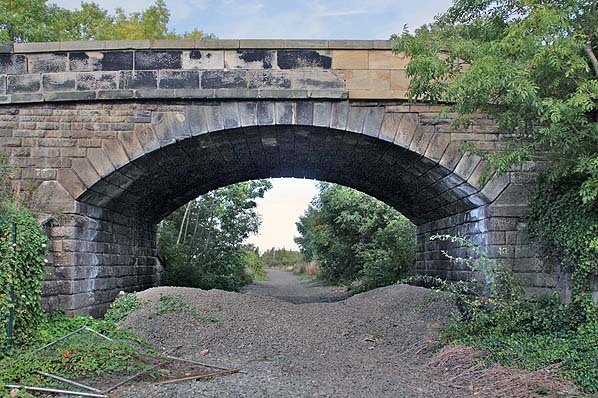 If it did exist a possible site is at Marks Lane bridge, where the road crosses over the Old Main Line, since this is a point where access to the railway was possible by an existing road. Sometimes evidence of a former station site is preserved in the boundary lines of railway-owned land, but there is nothing convincing in the stretch of line where the station might have been. Looking north from Marks Lane bridge in November 2007. 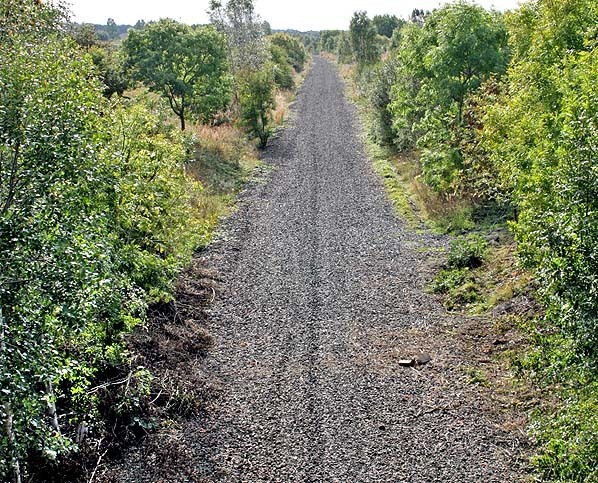 The rusting ‘mothballed’ tracks of the Old Main Line are seen here between Leamside and Fencehouses, at what might have been the site of a station called Rainton. A view south from Mark Lane bridge in October 2013, a year after the track was lifted. 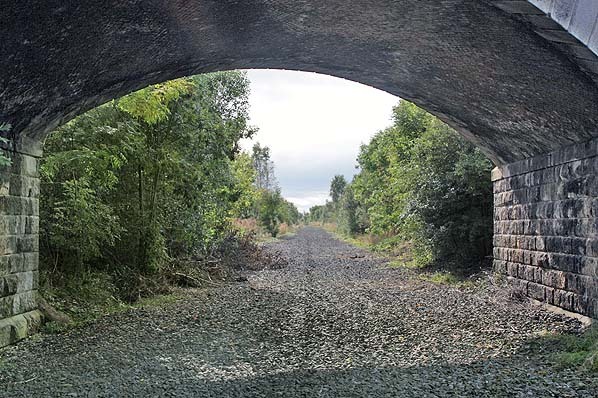 If Rainton station existed it is likely to have been either north or south of this bridge. 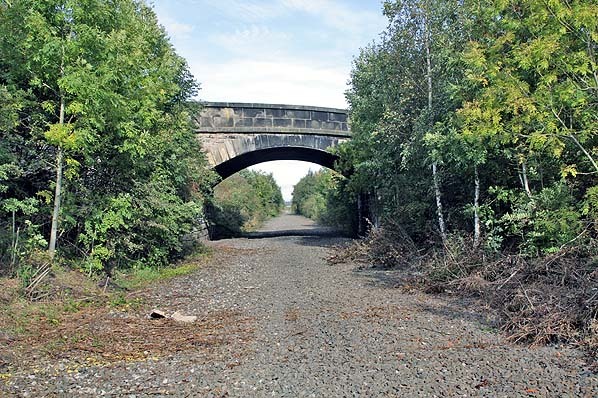 Looking north at the two possible sites of Rainton station in October 2013, a year after the track was lifted. The station could have been either side of the Mark Lane bridge. Looking south from beneath Mark Lane bridge in October 2013. 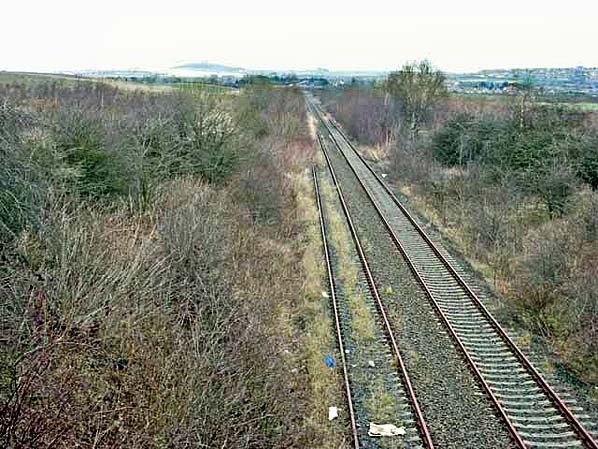 This is a possible site for Rainton station if it existed.